I should really make this its own blog and break libraries into separate entries. The current state of digital libraries, like the state of all libraries, is in constant flux. Being the outgrowth of a vision first suggested in the 1940s as “a new approach to information organization and discovery based on (a)…device enabling associative indexing and instant access to both a vast library and a scientist’s personal ﬁles,” digital libraries have been evolving for almost 100 years, even before the advent of publicly accessible computers. (Calhoun, Emergence) Perhaps digital libraries are best suited to adapt to that constant state of change. In, “Exploring Digital Libraries: Foundations, Practice, Prospects,” Karen Calhoun defines digital libraries as “Systems and services, often openly available, that support the advancement of knowledge and culture, contain managed collections of digital resources, and often use an architecture centered on a repository.” These libraries provide every type of information source imaginable, from digitized versions of physical artifacts such as museum collections, to digitally created items such as text documents, music, and video. In addition to these information sources, “digital libraries often provide value-added applications and services.” (Henry) For example, the Numisma Project, supported by the digital archives of the American Numismatics Society, provides standardized data management to other collections containing coin artifacts. 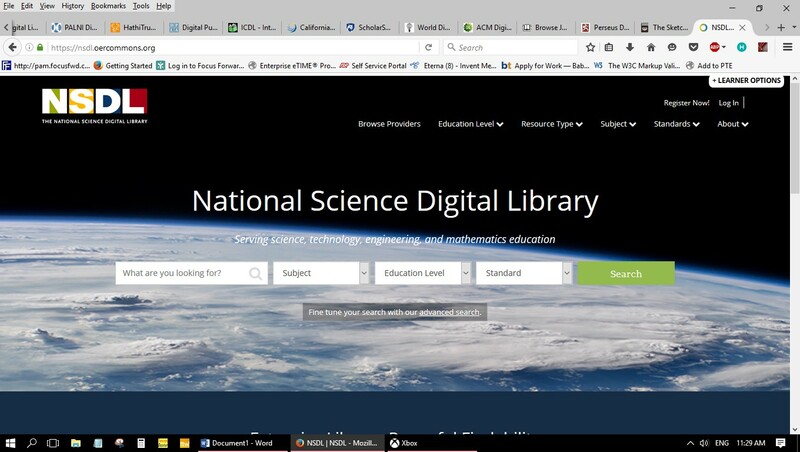 Science-based or educational digital libraries may offer online games, simulations, or lesson plans, such as those offered by the National Science Digital Library. As digital libraries have grown and evolved, some major issues have emerged. Most prominent are issues around digital rights management and copyright, as well as user accessibility. In regard to digital rights management, ebook licensing agreements illustrate the conflict between the library’s goal of meeting user information needs and the desire of content providers to increase profits by limiting user access. Christopher Harris writes in his article for Phi Delta Kappan Magazine that “If e-books are licensed, and the licensee goes out of business, there may be no recourse for the end user to legally access secured e-books.” In many cases, that end user is a digital library. What follows are several examples of digital libraries of various types. Though admittedly, there is something of a focus on crowd-sourced content, and I did go out of my way to find unique collections, these examples represent the breadth and depth of digital libraries because they represent sizes from large(NSDL) to small (Free Quilt Block Library), are maintained by various organizations from academic (Arnetminer) to social (Digital Comics Museum) to private (Baen Free Library), and showcase a wide variety of digital content (Sketchbook Project, Petrucci Music Project, Collection of Computer Science Bibliographies, Chinese Text Project, Civil Rights Litigation Clearinghouse). It’s audience is made of teachers and other educators serving education communities of all sizes. Examples of digital information sources AND services. Information sources come in many formats and from many sources, as can be seen at left. Describe at least three features you think are distinctive or simply “cool”. In addition to the provided resources, some other “cool” features of this digital library include the two different toolbars that are provided for different purposes when using the site. When viewing the archived materials, a toolbar is available that allows users to rate, save, comment on, evaluate, tag, and share resources. A second toolbar is revealed on the homepage under the heading learner options.” It allows site users to adjust settings to allow accessibility to for those with vision impairments. Finally, a third “cool” feature is the extensive search criteria available in an advanced search, which includes not only format type and education level, but also conditions of use, member interaction, primary user type, and resource accessibility. Purpose and audience of the digital library. This library is part of a collaborative art project. Its audience is not only those interested in viewing and interacting with finished art, but also those artists who have or are interested in participating. The library is a collection of sketchbooks created by various amateur and professional artists. Participation and inclusion in the physical library is open to anyone with few limits. Inclusion in the digital library requires payment of a $35.00 fee, which covers the digitization service. Other services provided by the library include inspirational challenges, book swaps, and an online store. Really, the content is one of the coolest features of this library. Books are tagged and arranged by theme, and can be browsed randomly. Another cool feature is its crowdsourced nature. Finally, the fact that it keeps count of how many views each book receives is also pretty cool. In this system, we focus on: (1) creating a semantic-based profile for each researcher by extracting information from the distributed Web; (2) integrating academic data (e.g., the bibliographic data and the researcher profiles) from multiple sources; (3) accurately searching the heterogeneous network; (4) analyzing and discovering interesting patterns from the built researcher social network….Currently, the academic network includes more than 6,000 conferences, 3,200,000 publications, 700,000 researcher profiles. The system attracts users from more than 200 countries and receives >200,000 access logs per day. The top five countries where users come from are United States, China, Germany, India, and United Kingdom. The main feature of this library is the researcher profiles. The example below is a profile featured on the front page as one of 2016’s most influential scholars. Note this information is compiled by the library’s technology from other internet sources. Data from multiple profiles can be combined in infinite ways, to find the top experts in any given interest area, or to determine which researchers are most likely to present at which conferences. I think the coolest feature is probably the “expert bases” that allow you to find the top researchers in a given subject area. Each profile also offers the ability to “follow” any given researcher’s career as papers are published and citations are updated. There are also several rankings, such as one determining “best” paper vs. most cited paper at any given conference. The “Ego Score” seems kind of weird at first glance, but really it shows the relationship between the given researcher and his peers. That’s cool. 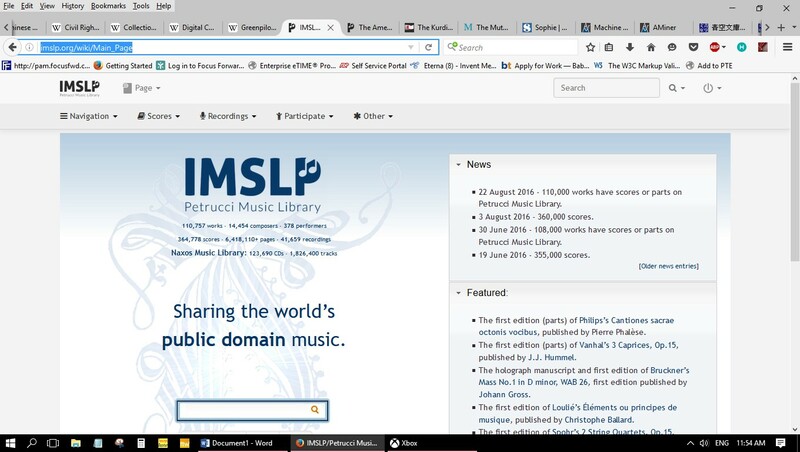 Similar to Project Gutenberg, the IMSLP Petrucci Music Library provides access to music that is in the public domain, and provides a great deal of information about pieces that are not in the public domain. Its audience includes musicians, composers, researchers, and the classical-music-loving public. The library is wiki-based, and anyone may contribute to it. Digital information sources mainly consist of scanned sheet-music files in pdf format, and recordings in many formats, but often including midi format, in addition to any other. Services include live chat and forums for contributors, and the ability to purchase scores and recordings directly from the library. Probably the absolute coolest feature I’ve seen in any library I’ve looked at was the ability to search for musical scores by melody. To do so, the user must pick out the notes on a virtual keyboard. Unfortunately, it apparently takes several days to retrieve results. Every time I tried it I got the same message. The participation inherent to the wiki format is a cool feature, as well as the ability for composers to contribute their own works. 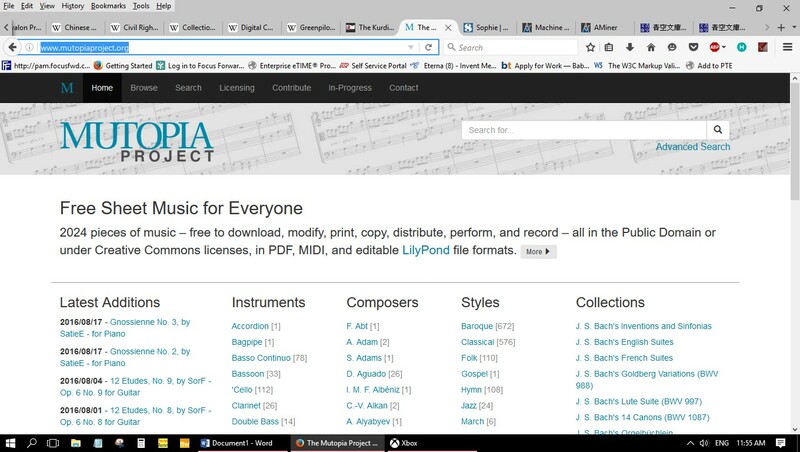 The Mutopia Project is another open-source music library. Although there are opportunities for volunteers to contribute specific tasks, this library is not crowdsourced to the extent that IMSLP is. The collection is far less extensive as a result, and appears to be more geared toward listeners and artists than academics or researchers, despite the fact that it is an academic project. Scanned images of sheet music and audio files in the public domain are provided and searchable by composer, instrument and style. Services include an RSS feed to be notified of updates, a discussion mailing list and a list of other open-source sheet music sites. The most significant “cool” feature here is the use of Lillypond typesetting program, which improves the visual quality of scanned music notation. Other cool features are the ability to search for solos, specifically, and the list of projects currently underway. The Collection of Computer Science Bibliographies appears to be created and maintained by Alf-Christian Achilles. On researching his bio, I found that the project has migrated to another site, associated with the University of Trier and Schloss Dagstuhl. However, the original site continues to be updated. This library’s audience is purely academic. 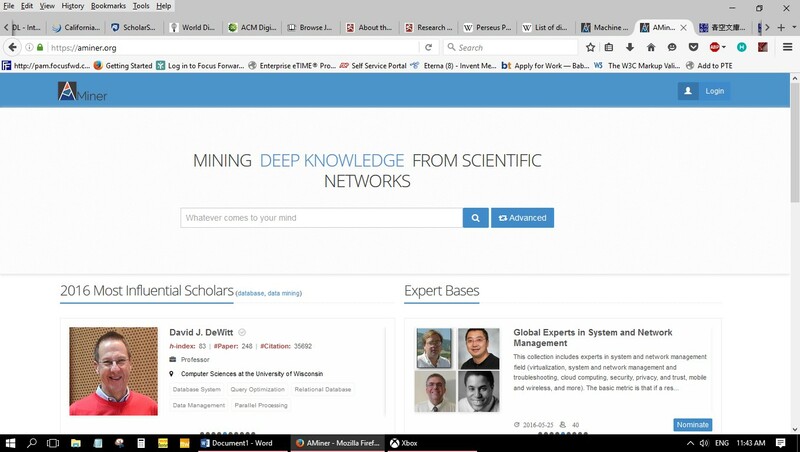 Its purpose is to collect and provide access to bibliographies of computer science research. This is a collection of bibliographies of scientific literature in computer science from various sources, covering most aspects of computer science. The bibliographies are updated weekly from their original locations such that you’ll always find the most recent versions here. 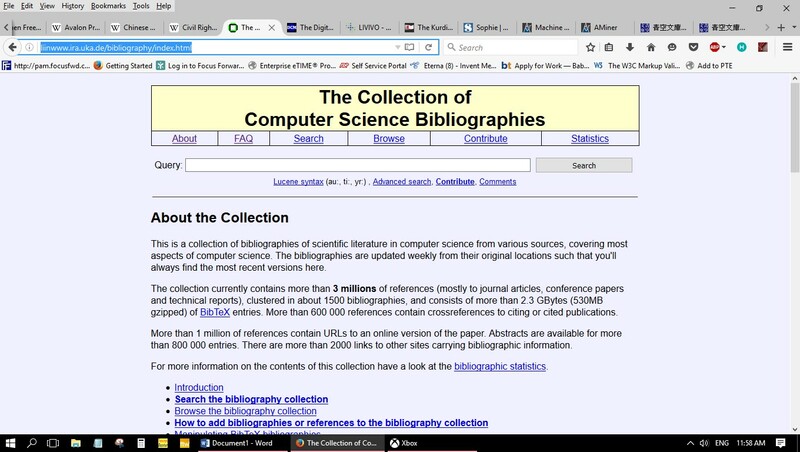 The collection currently contains more than 3 millions of references (mostly to journal articles, conference papers and technical reports), clustered in about 1500 bibliographies, and consists of more than 2.3 GBytes (530MB gzipped) of BibTeX entries. More than 600 000 references contain crossreferences to citing or cited publications. Cool features here are the statistics page, the change log that goes back to 1995, and the fact that the site runs on Lucene, an open-source search software, which is something I had no idea existed. 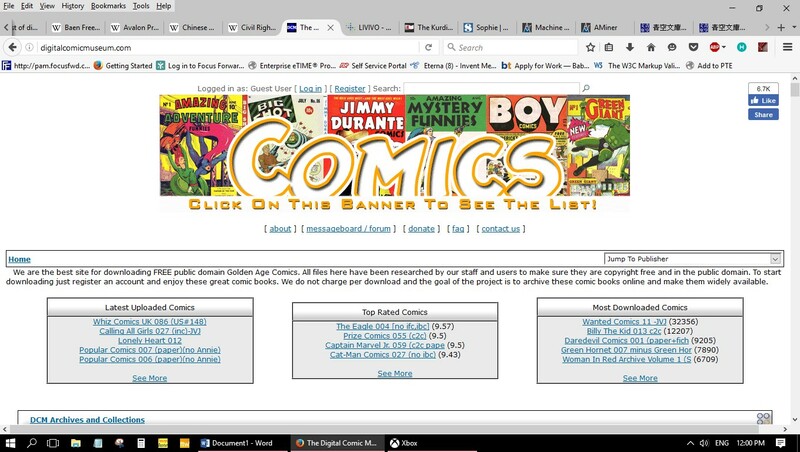 The Digital Comics Museum grew out of a golden-age comics fan forum. It is unclear who created it or is running it, as admins only identify themselves by internet usernames. The purpose of this library is to collect and provide access to digital scans of golden-age comics, and its audience is made of collectors and fans of those materials. This is another crowd-sourced library of items in the public domain. Services include a forum for users, the ability to download complete scans, and staff verification of public-domain status for contributed materials. I find the advertisements to be more interesting than the comics. Take for example, this page, including the “Ladies’ Exquisite Engagement Ring,” on offer for $1.74. There are titles that don’t quite fall into the category of comics, but are in the collection because there might be comics inside, such as “Girls Fashion and Fun Magazine.” Then there is also a collection of illustrated government pamphlets, including one illustrated by Dr. Seuss. Examples of digital information sources AND services. Use screen captures to visualize your examples. For each included case, we gather available crucial documents, including: the docket sheet, which indexes the litigation’s progress in court from filing to termination; the complaint, which initiated the litigation; any decrees issued by courts or agreed to by parties; and any published opinions. If we know about other case-related resources—website, case studies, and the like—we link to or post them. (For opinions published via Lexis or Westlaw, we often provide links to those services rather than the opinions themselves, but we are also working hard to find and post public-access versions of the opinions.) Finally, the law students who work on the site also summarize each case: where, when, what was involved, outcome. This page gives more detail. 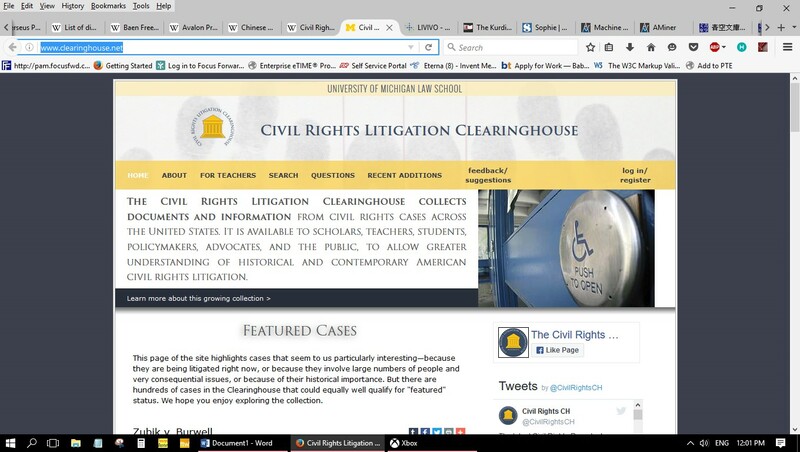 The CRLC offers lesson plans for teachers in the Civil Rights Litigation Schoolhouse. There’s also a glossary of legal terms. Collection statistics shows the status of collections as they’re being coded. 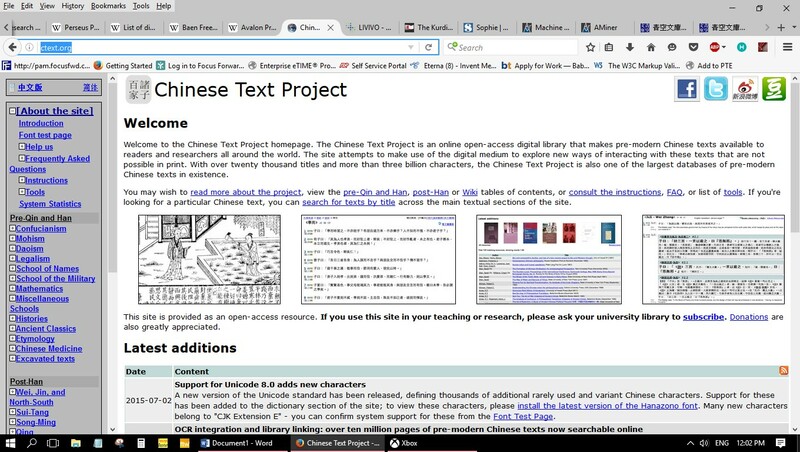 Main contents and features are extensive and include the Ancient Text Database, an integrated dictionary, word lists, parallel passage information, scanned source texts, concordance and index data, a metadata system, advanced search, Chinese commentary display, a published resource database, a discussion forum, and a wiki. Specific examples of texts include the Analects of Confucius translated to English in-line. Other subjects of texts range from philosophy to math to medicine. Describe at least three features you think are distinctive or simply “cool”. Use links and/or screen captures to illustrate your points. Distinctive features include a dictionary that allows search by character, pronunciation, and radical. The dictionary also includes a list of “Rulers of the states.” There is a test page that allows users to determine if their browsers support traditional Chinese characters, and a phonetic conversion tool that converts between different phonetic representations of Chinese. 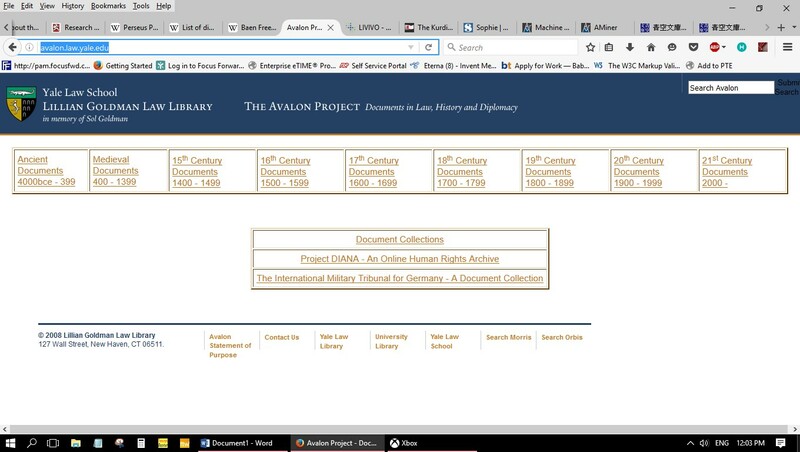 The Avalon Project is hosted by the Yale Law School’s Lillian Goldman Law Library. It appears to aimed at researchers and academics as its primary users. It includes “digital documents relevant to the fields of Law, History, Economics, Politics, Diplomacy and Government,” dated from 4000 BCE to the present. There isn’t much distinctive or cool about this library, beyond the age of the materials. There seems to be no associated metadata, except for the author’s name and a source citation. Often, a citation is not included. The Baen Free Library is collection of 72 books, published by the Baen Publishing Company, that are offered free of charge to anyone. Items may be read online or downloaded to read offline. It’s purpose is to drive sales, and its audience includes booksellers, librarians, and readers. Free titles are offered in six different file formats, as well as html. A link to send a book via email is provided, as well as ratings from readers. Most of the services relate to marketing books for sale. However, there is a free podcast, and instructions on how to use an ereader. 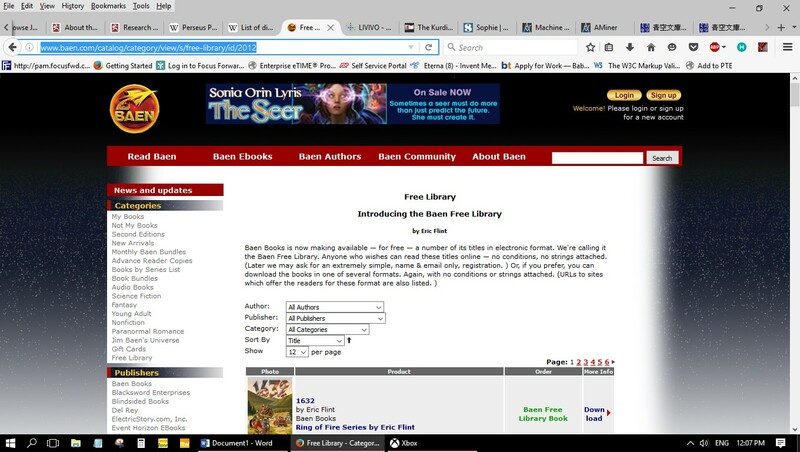 It appears as though Baen has created its own navigational platform for online reading, which allows readers to easily change font size and style on a desktop computer, or bookmark their page. Each online book includes a “cover page” with a thumbnail image of the cover, as well as a transcription of the cover’s text. Copyright information is here also. Wikibooks is for textbooks, annotated texts, instructional guides, and manuals….As a general rule, only instructional books are suitable for inclusion. Non-fictional books (as well as fictional ones) that aren’t instructional aren’t allowed on Wikibooks. Literary elements, such as allegory or fables, that are used as instructional tools can be permitted in some situations. What makes this library unique is that not only are users submitting completed or previously published content in full, as is the case with other crowd-sourced libraries mentioned above, the users are writing and editing the content themselves. The “Card Catalog Office” serves as that starting point for browsing the collection by subject, or a number of other categories, and instructions are provided on how to use metadata when adding content. There are two sub-collections, a cookbook intended to “document all aspects of cooking from recipes to culinary techniques” and Wikijunior, a version of Wikibooks intended for children up to age 12. Another distinctive feature is that most, if not all Wikibooks may be download as a .pdf file for off-line reading. 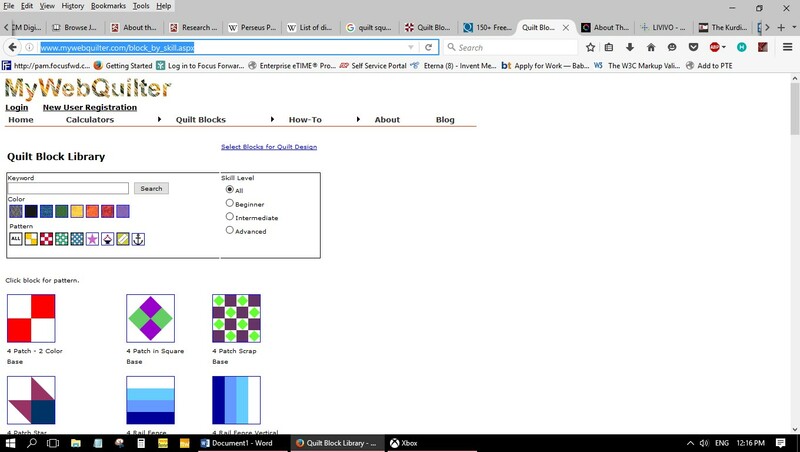 The most prominent feature of this library is the collection of quilt block patterns, which can be searched for by keyword, pattern, color, or skill level. A number of calculators are provided for determining sizes and quantities for various aspects of quilt-making, such as backing, borders, and measurement conversion. A selection of how-to articles are provided explaining various techniques. However, the most distinctive elements of the library are the creative tools provided to customize blocks selected from the library. For example, users may customize block colors, and then save the results. Another allows users to design a quilt using their selected blocks, adjusting not only the position and arrangement of squares, but adding borders and changing the number of rows and col umns. Calhoun, Karen (2014). Emergence and definitions of digital libraries. In, Exploring Digital Libraries: Foundations, Practice, Prospects. ALA Neal-Schuman. This chapter provides an excellent, global overview to digital libraries. Calhoun, Karen (2014). Glossary. In, Exploring Digital Libraries: Foundations, Practice, Prospects. ALA Neal-Schuman. Henry, Geneva (July 2012). Core Infrastructure Considerations for Large Digital Libraries. Council on Library and Information Resources.